Let's start with the basic picture: When you open a telnet session to a router, the input and output is captured by the Exec process. 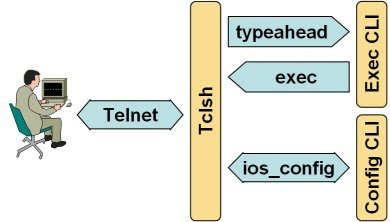 When you open an outgoing telnet or SSH session to another router, the Exec process implements the telnet/ssh client functionality and switches the input/output data between the two TCP sessions: However, when you start the Tcl shell, the Exec CLI loses its control of the input/output streams, as they are taken over by Tclsh. The only means of communicating with the Exec CLI is through the typeahead and exec commands: So, if you start another Telnet session with the exec command, the Tclsh still controls the input/output of the user session and there is no way for the telnet client in the Exec CLI to communicate with the user. I want to get the running config of a remote router from a local router. How can I do with TCL ? I have searched many but can not find the solution.